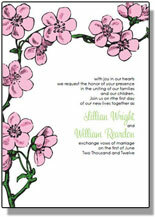 These free wedding invitation templates are a perfect compliment to a spring or summer wedding; coordinate with your pink wedding color palette, or for a picturesque lake or pond side ceremony. Our templates are customizable. What does that mean to you? Well, you can change the wording, fonts, font size, and/or font colors to mix and match to your hearts content. 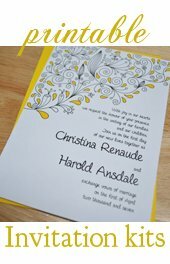 Stylize your wedding stationery to match your style and event! I've included a bit of a small invitation kit with this template set. 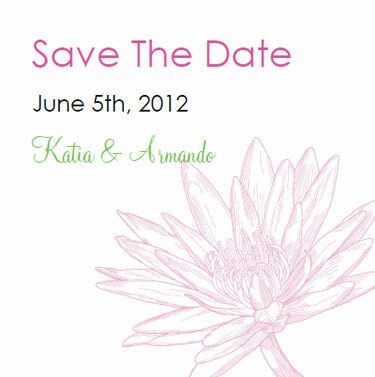 Now you can print your own waterlily wedding invitations, Save the Dates, response cards, place cards, and even favor tags. All for free and from the comfort of your own home! Can't beat that! I really hope you enjoy them! The template is pre-loaded with wording and suggested font colors. However, the interactive PDF files use the fonts that are installed on your computer. I suggest taking a lil' trip over to one of the free font wesbites such as Dafont.com, or even shopping around a bit at Myfonts.com. I really, really like FontBros.com as well. To customize and personalize the invitation template simply highlight the text you wish to change and press the "Control" and "E" buttons at the same time. This will bring up a typing tool palette. Select the fonts, colors, sizes, and alignment you would like for your text. After personalizing the text to your liking simply print the template onto some nice thick white card stock. I prefer to use 110 lb. white. Always make sure and print at your printer's highest quality settings for the best results. 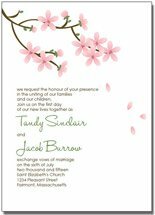 These free wedding invitation templates are perfect printed on a nice heavy cardstock, trimmed to size, and used "as-is" with no further embellishment. 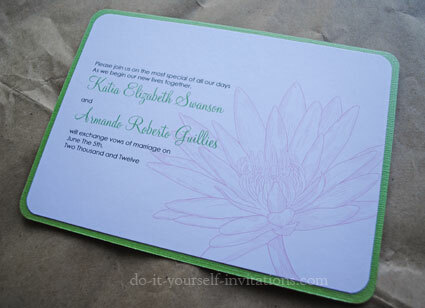 BUT, for those crafty diva brides-to-be out there, you can take these waterlily wedding invites to the next level! Get together some matching/coordinating cardstock or decorative papers, ribbons, and more. 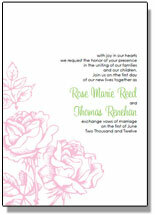 Pocketfold Invitations are a very popular choice these days. And we even have the matching response cards for you to tuck right into that little pocket. 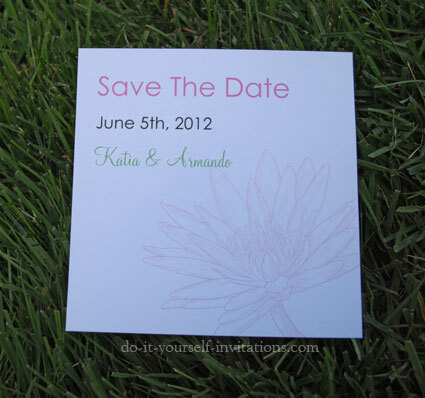 You could even use the Save The Date temp[late as an enclosure card by trimming it down to a smaller size! 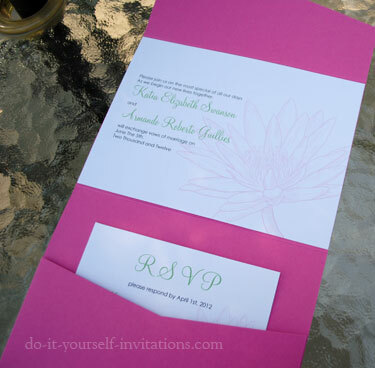 Use some double sided tape or a glue runner to attach the invite to the inside of the pocketfolder. Fill the pocket with your rsvp or other info pieces and tie everything shut with a matching bow. You can even attach one of the printable favor tags as a monogram emblem! I also really enjoy simply adding a nice cardstock backing. Choose a color that coordinated with your wedding colors and cut it to a size that is just a tad bigger than the invitation. Layer the two pieces by attaching the papers with some tape or glue. 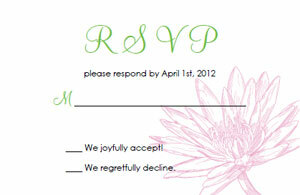 I added rounded corners to this invitation. I like the finished touch it lends to the invitation. You can do the same to the response card as well. To round the corners all you need is a corner punch. You can find them pretty inexpensively at most craft stores, or even shop online. 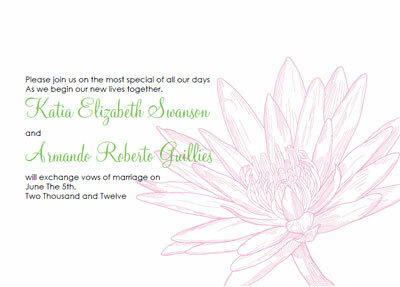 These save the dates were simple printed, trimmed, and used as is, and unadorned. Not too spiffy, eh?